1. McDonaldland – What became of McDonaldland? When I was a kid, going to McDonalds was a lot more involved than what I imagine it being like for a kid today. There was a level of mythos and lore to the experience that seemed unnecessarily deep for a fast-food company. Well, starting in the 1970s, as McDonalds transitioned from being a drive-in restaurant to a “dine-in” establishment, the company started heavily branding their kid’s stuff with McDonaldland. There was basically a character for everything on the menu that was relevant to a kid (no salad shaker characters). The thing that got me wasn’t just the cast of characters, it was the fact that they inhabited their own world. This world showed up in the commercials, on the placemats, in the happy meal designs, and on the playground. So what happened? 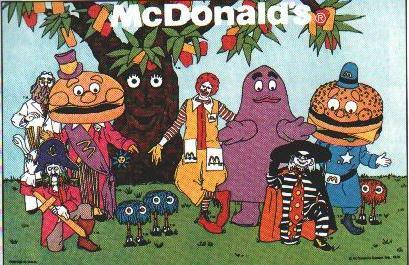 Sure, Ronald survived and so did a few of his friends – Grimace, the Hamburglar, even Birdie shows up from time to time. But Mayor McCheese, the Fry Guys, Big Mac, the Professor (?! ), and Captain Crook all seem to have disappeared. Well, Sid and Marty Krofft successfully sued McDonalds in the 1973, claiming that the entire concept was a ripoff of their show and specifically citing Mayor McCheese as being too similar to their own H.R. Pufnstuf. It didn’t help things that McDonalds had originally hoped the Kroffts would license their characters for McDonalds promotion in the early 1970s. As a result, the McDonaldland concept was gradually phased out and replaced with more a more sterile environment, which remains to this day. It’s a shame. 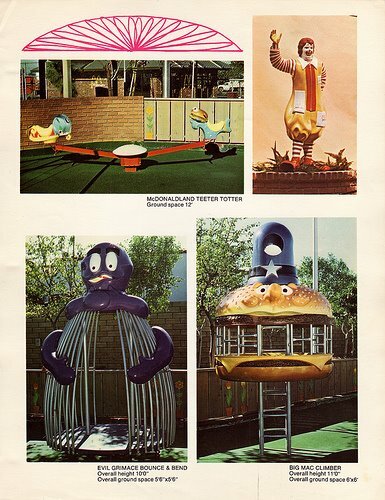 Whether intentionally or unintentionally, McDonaldland spoke to me as a kid as a place that seemed simply too bizarre to be real. 2. What Will Life Be Like in 2008? 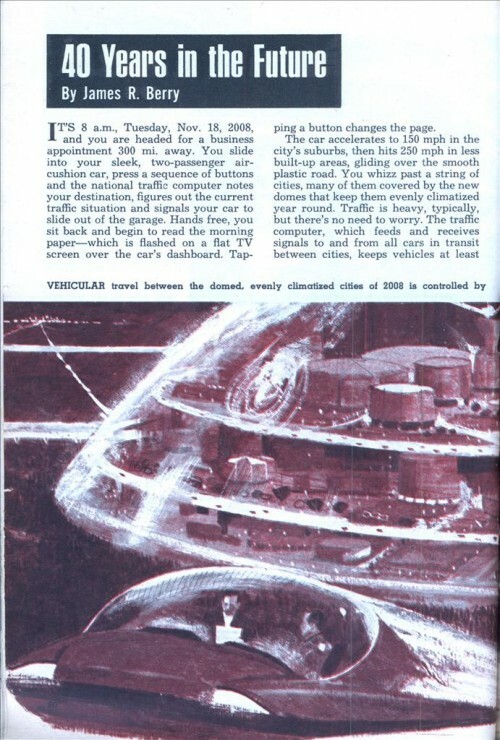 – Found this great article on Modern Mechanix from 1968 forecasting what life would be like forty years from then. Might have been a few years early on the plastic streets, dome cities, national traffic computers, undersea resorts, and intelligence pills, but there’s a few things here that are close-ish. And it’s got huge helpings of that “dream big” mentality of the 1960s and 70s that really speaks to me. 3. RCA Remote – Pie Shops turned me onto this RCA long-form ad from 1961 that features that “amazing new wireless wizard electronic remote control”. It controls ALL SEVEN FUNCTIONS. In CRISP, CLEAR, BLACK AND WHITE. Is that a hookah next to the television at the beginning? 5. Tomorrowland Signs – Imagineering Disney’s got a great feature on some old signage from Tomorrowland at the Magic Kingdom. Design-wise, pretty inspiring. Additionally, I get a kick out of the fact that Wise potato chips hosted anything, ever. They were always the “field trip” or “box lunch” chip; the one you’d never order yourself but would eat if it were given to you. 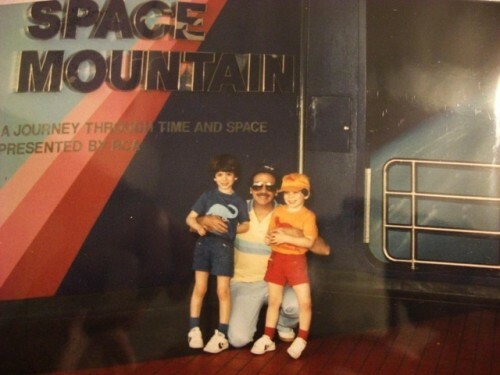 Not really sure how Space Mountain is a journey through time, except maybe the line (hey-oh! ).